Sepir Private Villa & Spa is strategically located in the middle of major resort and shopping arcade Jimbaran, just a walking distance to the beach, Jenggala Keramik Bali, legendary Jimbaran sea food bazzar, 15 minutes drive from international Ngurah Airport of Bali, 10 minutes to Bali Golf & Country Club Nusa Dua, 30 minutes to Sanur Beach. 7 Private Villas, tatched roof style, highly fashioned by Balinese traditional architecture, a private plunge pool, living room and restaurant. Sepir Private Villa has 5 deluxe villa, 1 junior villa with plunge pool, 1 Sepir Suite Villa two bedrooms with private plunge pool. Sepir Private Villa Bali designed with sensitivity toward the natural and spiritual environment. There is an extraordinary dining restaurant which is open 24 hours a day; natural stone based swimming pool and garden, kitchen and pantry area. 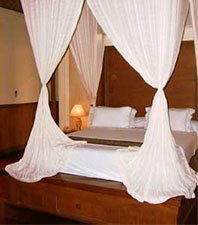 Sepir Private Villa Bali offers luxury and convenience at affordable price.